When you run an e-commerce shop, you know that your customer support is a key to success. So of course, you have an up to date FAQ section, and of course, your phone number and contact address are easy to find. But does it stop there? How can you make it even easier for your new visitors and existing clients to contact you, without stressing out your team? We have a great solution: our new Customer Support Extension for the Magento 2 platform. Helping you with pre-sales and after-sales communication. For both B2C and B2B e-commerce, customer support is key.  A winning website helps its customers with clear price information, extended product descriptions, no-nonsense service and an easy check-out system. However, what is often missing is a simple but effective Customer Support functionality. Sure, customers an call or send an e-mail, and sometimes a chat function is available. However helpful these may be, especially B2B companies find that online customer support can and should be done in a more effective and efficient way. For Magento 2 users, we have created a new extension that makes doing Customer Support easier, faster and much more efficient. Plus, it will boost your sales! The new Supportdesk extension simply adds an "Ask A Question" functionality on your product pages. All communication flowing from that can be done through your Magento backend. No need to search your old emails for questions, or even scribbled down phone conversations. All communication is saved in your backend, saving you time and money. Read through the main features of Supportdesk and discover how your customers and your team will benefit! Plenty of reasons to choose for Supportdesk! Read on for some more information on these features, or visit the Supportdesk page to see the front-end and backend demo. 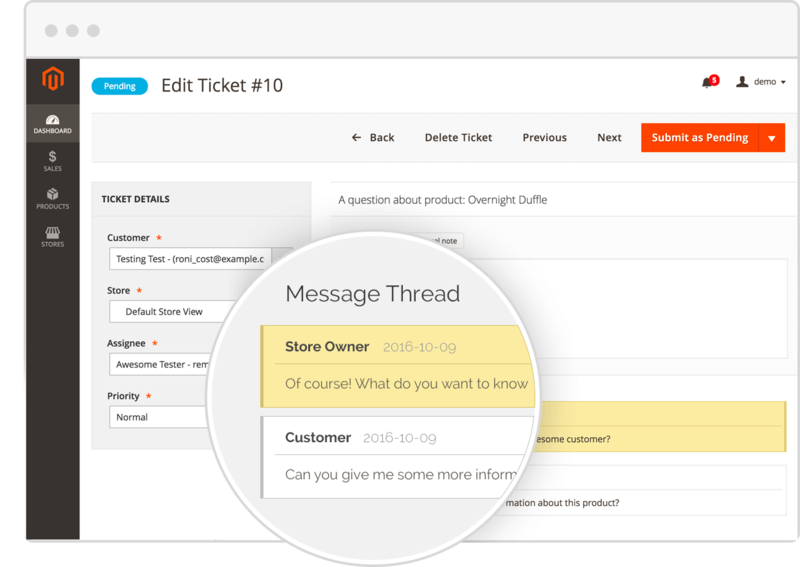 Supportdesk will enable you to place an "Ask A Question" tab on your product pages. So, next to the "Details", "More Information" and "Reviews" tabs, your visitors can click on "Ask A Question" and fill out a simple form. They do not have to look for your contact details, no need to send a separate email or call, they can simply fill out a few details and ask their question. Within seconds, you will receive an email notification with this question, and you can start connecting with your visitor! Supportdesk is not only making it easy for your new visitors, also your existing customers will benefit! 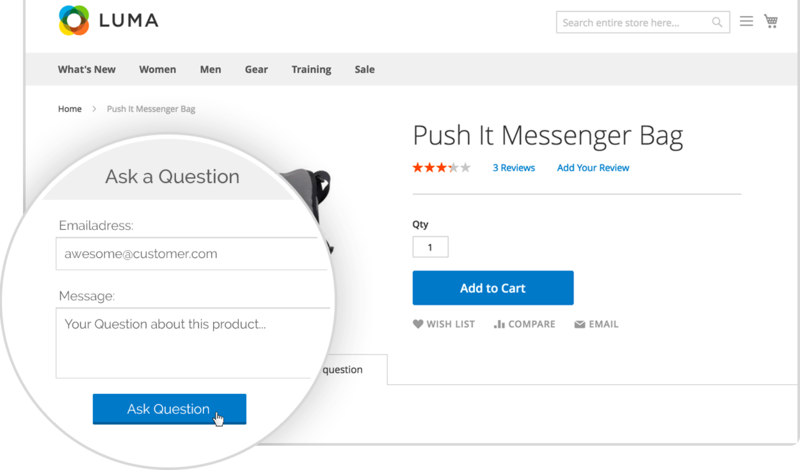 The "Ask A Question" form on the product pages is simplified for your customers once they are logged in. They only need to fill out a question, Supportdesk takes care of the rest. All product-related questions (tickets) are shown in a grid in the Magento 2 backend. 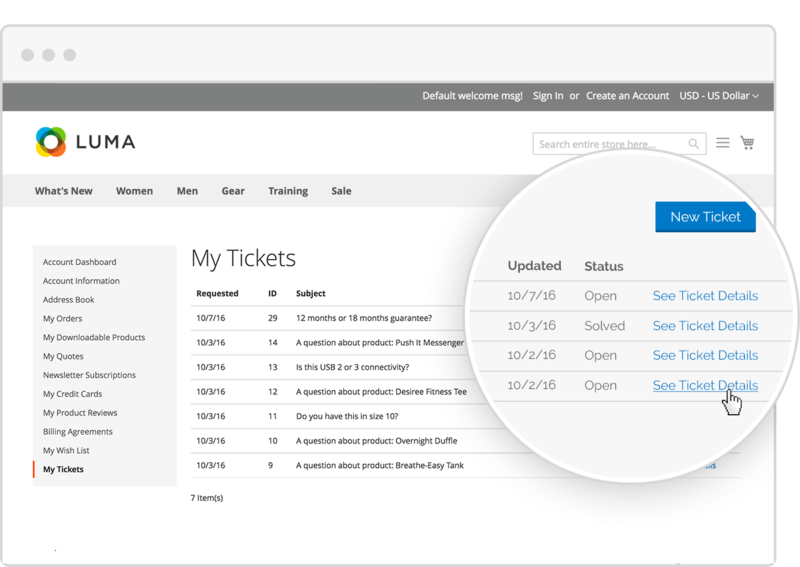 The admin can adjust multiple tickets at once, make changes to every ticket independently, assign different team members and send internal notes to colleagues. The grid works similar to what is normal in Magento; admins can create an overview of the tickets by customer name, status, and priority. Furthermore, the status of the tickets can easily be changed to open, pending or solved. This simple functionality will help your team to respond faster and more efficiently. 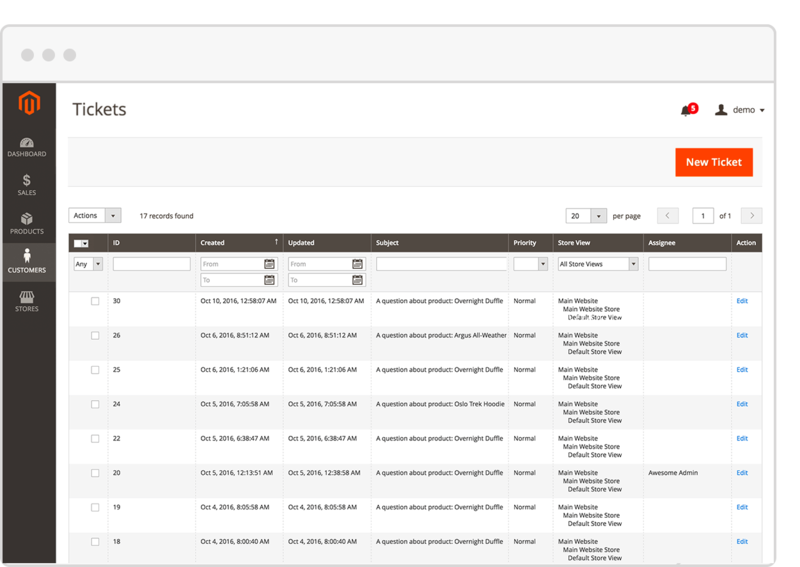 All from the regular Magento 2 backend, the admin can easily manage the tickets and see the complete threads between customer and admin. Even when multiple colleagues are responding to tickets, the history of the chat will always be saved. Supportdesk will really help your team of admins to respond fast and accurate to customer questions, but it will also serve your customers in a helpful way. We already stated that once customers are logged in, they won't have to fill out details when sending a question. A big plus is that they will also have a great overview of the ticket threads in their Customer Dashboards. Having all this communication in one overview will stimulate fast and personal contact between your team and your customers. 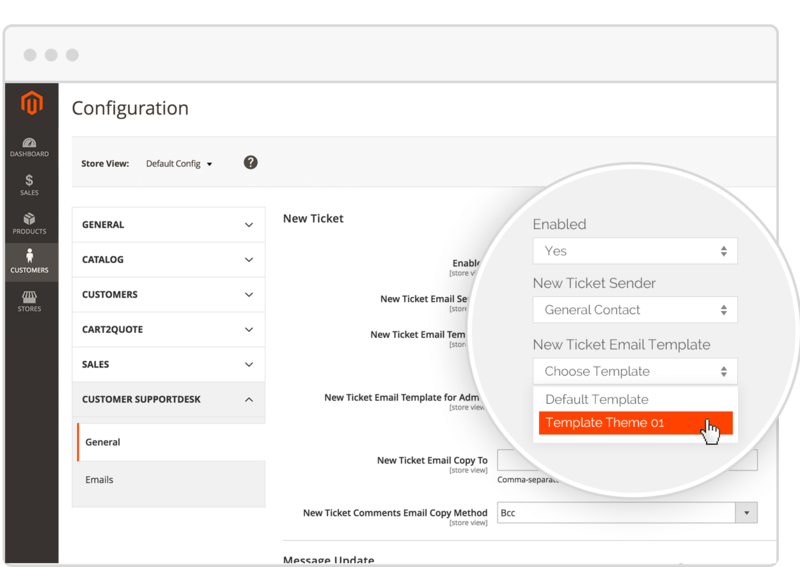 Lastly, Supportdesk enables you to configure the standard e-mail templates. You decide how the notifications and messages for your customers will look. Use the standard Magento backend to manage and modify the email templates. How can Supportdesk help your business grow? Supportdesk is created by the Cart2Quote team. Cart2Quote has a wealth of knowledge and experience in B2B and B2C e-commerce for the Magento platform. Driven by a passion to make online business both pleasant and successful for both customers and store owners, Supportdesk is a fantastic tool to improve Customer Support for Magento 2 websites. Lower the threshold for visitors to contact you, make communication easy, and convert visitors into customers! Visit the Supportdesk Page and learn more.